After a sharp reversal in stock prices for energy companies, now's the time to take a look at ExxonMobil, Brookfield Renewable Partners, and Tellurian. The year 2018 has quickly gone from one of considerable gains for the energy market to a bear market with oil prices below $50 a barrel and stocks taking a sharp turn toward 52-week lows. At the same time, renewable energy stocks have struggled in their own right trying to navigate the many regulatory changes over the past year. While this sharp drop may look ugly when checking your portfolio, it can also present investors with a few buying opportunities. 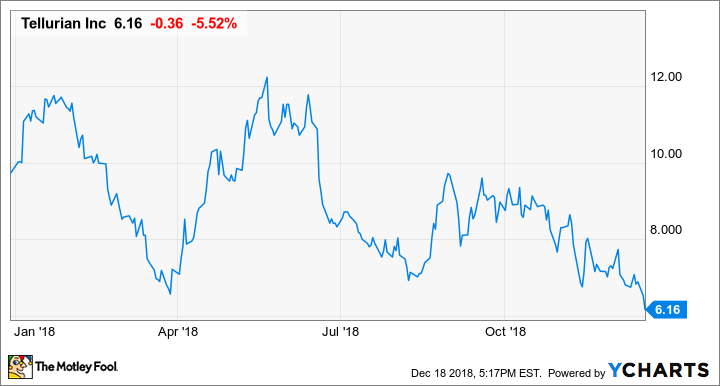 So we asked three of our Motley Fool contributors to each highlight an energy stock that looks attractive this month. Here's why they picked ExxonMobil (NYSE:XOM), Brookfield Renewable Partners (NYSE:BEP), and Tellurian (NASDAQ:TELL). Rich Smith (ExxonMobil): I realize this is kind of a "gimme" when talking about energy stocks, but I really believe ExxonMobil is an important energy stock to watch in December. Why? Well, consider what's been happening with the price of oil lately. Over the past couple of months, we've watched oil prices for WTI crude plummet from north of $75 a barrel to just a couple of bucks above $50. ExxonMobil stock has come along for the ride, declining 11% from early October to early December. And yet, just this week, Citigroup came out with a forecast predicting oil prices will finally settle down in the new year -- not at today's price, though, but at something closer to a $60-a-barrel average. Assuming Citi is right about that, this means a near-20% hike in the price of oil could begin building -- and probably soon, what with this winter looking like a cold one and OPEC promising to cut production of oil. It seems to me, therefore, that if the price is right, then right about now should be a fine time to buy Exxon stock, before higher oil prices translate into a higher Exxon share price. And Exxon's stock price does look right to me. Priced at just 14.1 times earnings today, Exxon stock pays a 4.2% annual dividend, and is pegged for 23% long-term earnings growth on Yahoo! Finance. Combined, that works out to better than a 27% total return likely from Exxon -- a bargain at 14.1 times earnings. Jason Hall (Brookfield Renewable Partners LP): Units (MLP-speak for "shares") of Brookfield Renewable have fallen more than 26% over the past year, in large part because interest rates have steadily gone higher. And while rising rates aren't great for Brookfield Renewable, which uses a substantial amount of debt to fund acquisitions and project development, there's a very clear argument that the market's sell-off of this well-run renewable energy producer has created an excellent opportunity for investors. This is because, in short, Mister Market has a habit of letting short-term things cause it to miss the excellent job Brookfield Renewables' management has done of allocating capital and steadily building a stronger, bigger business. Through its most-recent quarter, Brookfield Renewable had some 90% of the power its assets generate sold under long-term contracts, which generate enough cash to support its quarterly payout and then some. Last quarter, it paid out about 87% of cash, and management expects to get that ratio down to 80% within a few quarters, freeing up even more capital to reinvest in high-return renewable energy assets. But even without big growth, Brookfield Renewables is very cheap, selling for less than 11 times expected full-year 2018 cash flows. 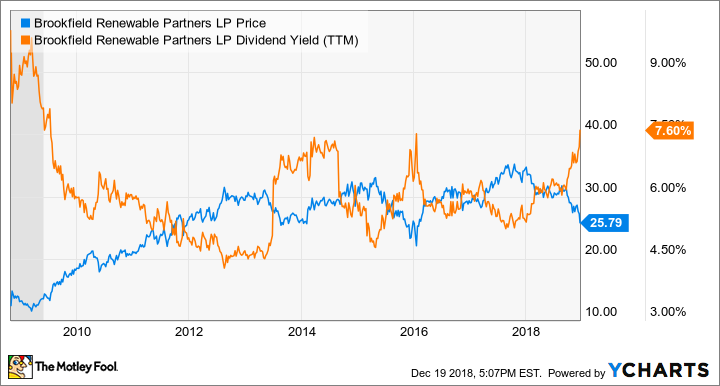 Combined with that 7.6% yield, it wouldn't have to achieve very much growth at all to deliver double-digit returns for investors. That makes it my top energy stock right now. Tyler Crowe (Tellurian Inc.): When you are a company that's just a business plan, your stock is bound to be volatile. That has been the case with Tellurian so far in 2018. The company intends to construct a liquefied natural gas (LNG) export facility in the U.S. Gulf Coast, but it is starting from scratch. The path ahead of it is incredibly challenging, as it will need to secure partners, permits, and capital to construct the facility and make this plan a reality. With so many things still up in the air, it's not surprising that the stock has been incredibly volatile for much of the year. In terms of the business, not much has changed in 2018. It is still working on negotiating equity partners for its facility and awaiting the necessary permits to export LNG. The one notable change to the business plan is that instead of raising all of its funding needs through equity partners, it expects to take on some debt in order to partially fund the project. The reason investors should probably keep an eye on this stock is that we should expect some major events that could be stock catalysts over the next few months. In January, Tellurian expects a final environmental impact statement, which is the final regulatory hurdle. We should also expect announcements related to its project partners soon. In fact, the company already announced a memorandum of understanding with commodity trading house Vitol that will likely result in a long-term takeaway contract. U.S. natural gas is one of the cheapest energy sources in the world, which makes exporting it a highly lucrative business. If Tellurian's plan can fall into place over the next month or so as planned, then this will be a stock to put on your radar.